and most of all Lots of Fun! 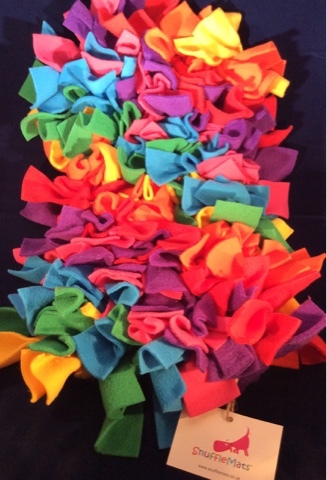 SnuffleMats are a fun, interactive dog toy that encourages natural foraging behaviours. 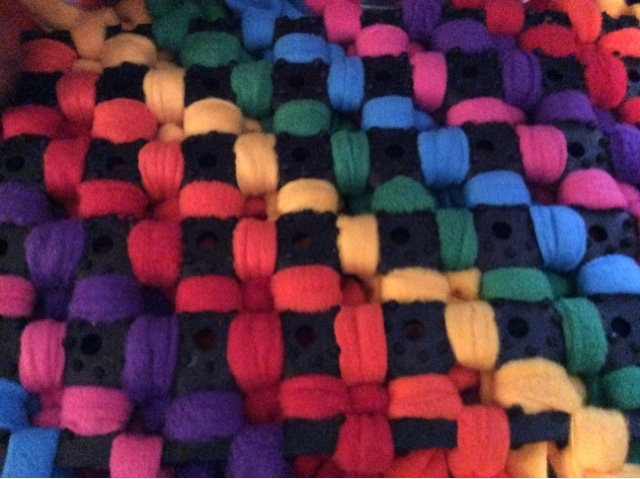 Basically it's a fleece rag rug style mat, but instead of the traditional canvas base, it has a sturdy rubber one. The idea is that you hide dog treats between the fleece pieces and your dog uses their sense of smell to find them. This is not only fun for the dog, but it also keeps them mentally stimulated and stops them getting bored. I used small training treats with the SnuffleMat, but kibble would also work well. I was initially worried that the treats would fall through the gaps in the rubber base. But because the fleece is high quality and very thick, the treats were safely held within the mat. It's surprising how many treats the mat will hold - you could easily hide your dogs entire meal in the mat. This would be ideal for dogs that gobble their meal up too quickly, as it would both slow them down and keep them happy and occupied for longer. Because the base of the mat is rubber, it stays securely in place on the floor, even with dogs pushing and pulling at it. I did expect it to go sliding across the floor, but the grip and weight of the rubber ensured that it stayed put. I've used it on hard flooring, carpet and even on my bed (it's easier for me to reach as I'm a wheelchair user) and it stayed in place well on every surface. 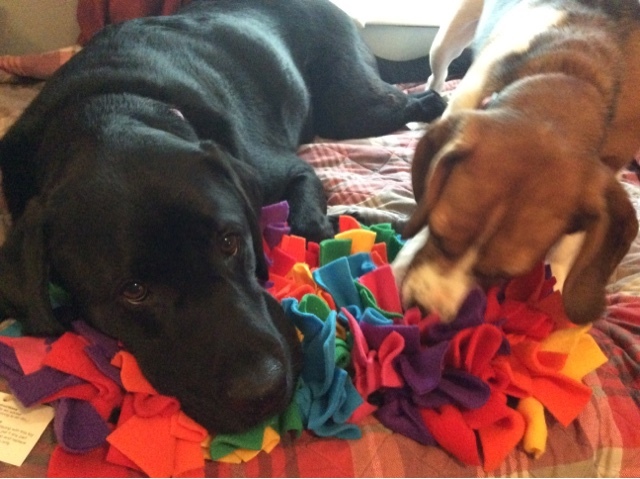 Both my Labrador and my beagle love their SnuffleMat - they've had hours of fun with it! I expected my lab to enjoy it as he likes puzzle type games, but I was surprised with how much my rescue beagle enjoyed it. She's a very nervous dog and she's usually scared of new objects, but she instantly realised that the SnuffleMat was a source of fun and most importantly, treats! She was very good at using her nose - she really did snuffle! You could tell she is a scent hound because she was a lot better at finding treats than Elgin! It was lovely to see how the SnuffleMat brought out her natural instincts. The SnuffleMat kept them busy treat hunting for a long time. Just a few treats kept Cherry happy for at least half an hour at a time. She kept playing with the mat long after all of the treats had been eaten. Elgin played with it for quite a while too, but he stopped snuffling once he'd found the last treat. Apparently the SnuffleMat also makes a good pillow! You could hide more treats in the mat to keep them busy for longer. After 30 minutes of snuffling Elgin realised all of the treats had been found, but Cherry was still busy treat hunting! A family member has recently bought a different branded mat for their dog, and I have to say that the SnuffleMat is far superior to the other brand. The holes in the other mat are much too big and small treats and kibble fall through the gaps. It is also much lighter than the SnuffleMat which causes a few problems as it moves around too much, which meant their dog got very frustrated chasing it around. The SnuffleMat is a very high quality interactive dog toy. It's worth every penny in my opinion, as our dogs get so much fun from it. I can see it lasting us for a long time. I definitely recommend SnuffleMats, they get five stars!